At TriLink Saw Chain we believe that quality is the key to success. TriLink Saw Chain begain operations in America, headquartered in Atlanta, in 2005. Now with officies in various U.S. cities, South America, Europe, and Asia, TriLink is proudly distributed in over 42 countries around the world. TriLink has built a reputation on providing the best quality, value, and service in the industry. Our guide bar and saw chain factory is ISO 9001:2015 certified. This gives our customers the confidence they are buying from a company committed to providing quality products. We strive to provide our customers with value in production quality, pricing, and customer support. We strive to continue to deliver value to you. We continue to deliver on our promise to provide value and quality throughout the process; from innovation to distribution to the customers hands. TriLink Saw Chain is proud to introduce our new line of machine harvester chain and guide bars. Complementing a full line of handheld saw chain, guide bars, accessories, and safety equipment TriLink’s harvester line provides a superior and more durable alternative over the competition. TriLink Harvester chain is manufactured from high quality alloy steel. The micro radius semi-chisel cutters increase cutting speed while providing wear resistance. The booster kerf and enhanced multi-layered chrome plating provide advanced cutting efficiency and durability. TriLink Harvester guide bars are made of solid steel for the extreme demanding cutting challenged faced by operators. The fully riveted nose construction adds strength absorbing the majority of wear. Our new machine harvester line is engineered for maximum performacne and dependability. TriLink is your link to quality. TriLink guide bars are designed to provide a guide and support rail for the moving saw chain. We offer several different types of guide bars including Carving bars, Mini Laminate Sprocket Nose, Laminate Sprocket Nose, Replaceable Sprocket Nose, and Hard Nose bars. Click the button below for a full listing of all our guide bar mounts, lengths, and styles. The safest chain is a sharp chain. Proper sharpening and maintenance ensures that your chainsaw and saw chain continue to run smooth, cut fast, and last longer. TriLink offers a complete range of maintenance tools, cuttings accessories, and safety equipment to fit all of your saw chain needs. TriLink saw chains are engineered for precision, balance, and low vibration. All chains are manufactured with advanced heat treatment and a hard chrome finish on the cutters to provide an improved cutter performance. We offer both semi-chisel and full-chisel saw chain, both of which are designed specifically for each individual needs. 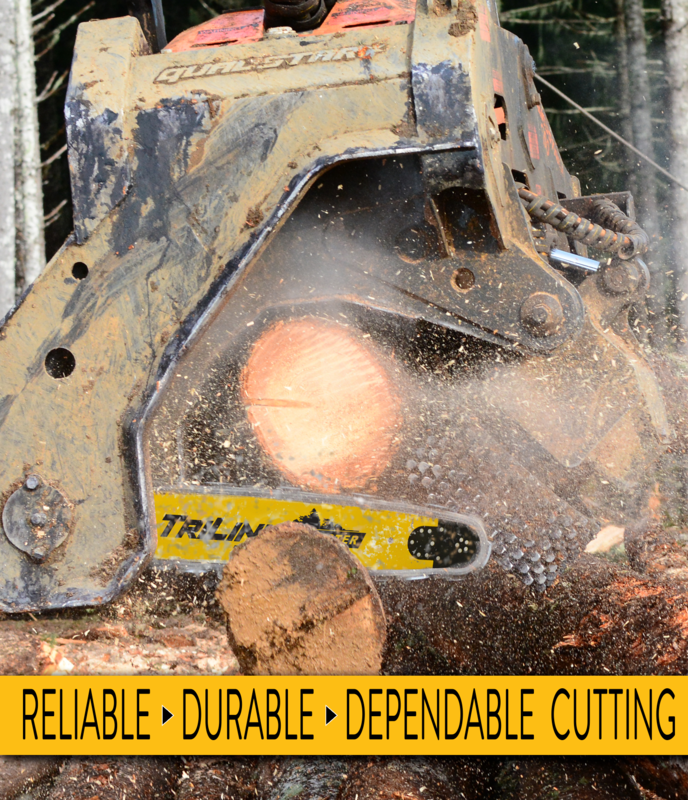 TriLink offers a wide range of logging tools for all of your logging needs. Our tools makes it easier than ever to handle, roll, and position logs with minimal tearing of the logs and for a more secure grip. Quality, value, durability, and dependability are what we at TriLink strive for in all our products. Our new Harvester line of products are engineered for performance and dependability. TriLink believes that safety is a key component in cutting and offers a complete line of safety products including gloves, chaps, glasses, helmets and much more. If you have thoughts, concerns, or questions please choose the correct department and leave a message. For questions regarding an order, please contact our toll free number below or send us an email.